Our range of products include polypropylene boxes. 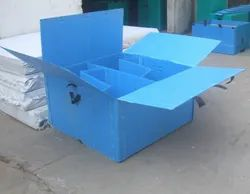 We offer exclusive range of PP Boxes, which are manufactured by using high quality raw materials. We use the latest production technology for manufacturing these boxes. We offer custom made foam inserts and EPE Foam Buffer packing, which can be of any shape and size as required by you. The foam has excellent compressive strength and low compression set.